The immigrants were a mixed multitude. They came from England, the Netherlands, the German and Italian states, France, Africa, Sweden, and Finland, and they moved to the western hemisphere for different reasons, from different social backgrounds and cultures. They represented a spectrum of religious attachments. In the early years, their stories are not mainly of triumph but of confusion, failure, violence, and the loss of civility as they sought to normalize situations and recapture lost worlds. It was a thoroughly brutal encounternot only between the Europeans and native peoples and between Europeans and Africans, but among Europeans themselves, as they sought to control and prosper in the new configurations of life that were emerging around them. 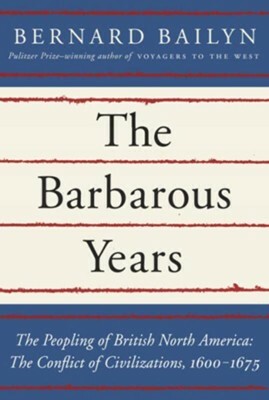 Bernard Bailyn did his undergraduate work at Williams College and his graduate work at Harvard, where he is currently Adams University Professor and James Duncan Phillips Professor of Early American History Emeritus. His previous books include The New England Merchants in the Seventeenth Century; Education in the Forming of American Society; The Ideological Origins of the American Revolution, which received the Pulitzer and Bancroft prizes; The Ordeal of Thomas Hutchinson, which won the National Book Award for History; Voyagers to the West, which won the Pulitzer Prize; Faces of Revolution: Personalities and Themes in the Struggle for American Independence; To Begin the World Anew: The Genius and Ambiguities of the American Founders; and Atlantic History: Concept and Contours. In 2011 he received the National Humanities Medal. "Magisterial . . . Popular histories often gentrify these early events, but Bailyns gripping, detailed, often squirm-inducing account makes it abundantly clear how ungenteel they actually were." "This weighty book distills a lifetime of learning of one of our most authoritative historians of colonial America. . . . A history of the colonies built up of brilliant portraits of the people who interacted in these strange and fearsome lands. . . . This is not your school-book colonial history. . . . Penetrating and stylish . . . An extraordinary work of profound seriousness, characteristic of its author." "Drawing on decades of sound, dynamic research, the author has provided scholars and general readers alike with an insightful and engaging account of Colonial America that signals a reset on Colonial studies, the culmination of his work. An important book. . . . Superbly told." "In Bailyns perceptive and erudite hands, the original British, Dutch, and Swedish ventures assume as wild and variegated guises as did the forceful individuals who embarked on them." "Bailyn spares no gory detail, but he treats his subjects with sympathy." I'm the author/artist and I want to review The Barbarous Years: The Peopling of British North America: The Conflict of Civilizations, 1600-1675 - eBook.